Dr. Hamisi Babusa is the rare academic who confidently straddles both the Arts and the Sciences. 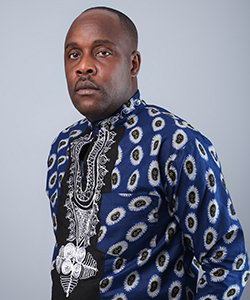 Dr. Babusa is an accomplished novelist, a lecturer at Kenyatta University and the first person to author science fiction novellas written in Kiswahili. Although he pursued an academic path in Kiswahili and Education, Dr. Babusa informs me that science was in fact his first love. He would watch science fiction movies with his parents and be enthralled by the fictional accounts of how the world works. As he went further into academia, he began to look at the education system with a more critical eye. He noted that the new curriculum is competency based and wondered if enough emphasis was being placed on learning to understand instead of memorization. Dr. Babusa’s theory is that it is easier to learn when being educated in a story format. Furthermore, he believes that learning in one’s first language, in this case in Kiswahili, is much more effective and it makes complex concepts easier to understand. Over a two-year period, Dr. Babusa has written five novellas following Makumba: MAKUMBA KATIKA SAFARI YA TONGE (Makumba in the Journey of the Ball of Food), MAKUMBA NA SELIDAMU NYEUPE (Makumba and the White Blood Cells), MAKUMBA NA MAJANABI (Makumba and the Aliens), MAKUMBA KATIKA SAFARI YA MAWIMBI (Makumba in the Journey of the Waves), and MAKUMBA KATIKA SIRI YA MWEMBE (Makumba in the Secret of the Mango Tree). The stories are aimed at readers in Standard 6 to Form 4, with an aim to entertain while disentangling seemingly complex concepts. Dr. Babusa wants young people to feel that science “can [initially] feel difficult but it’s not that hard”. Dr. Babusa is a prolific writer, and he is excitedly working on three new projects concurrently. He is writing a dictionary and other scientific novellas at the request of a new publisher. He has also authored a new series of six novellas, VISA VYA BINTI KITABU, about a girl with mythical book powers who uses them to improve her community. The full set is set to be released in January 2019. His books are available at all major bookshops around Kenya.